This is the first post to my new oil blog. I have decided to keep my pastels and my oils separate to offer a little more consistency. I felt that mixing the 2 mediums resulted in a non-cohesive site, as my styles for each medium are so different. I hope this will be easier to follow, and now I am ready to get a little more into oils since working more on the pastel site as of late. I am a mostly self taught painter in both mediums and truly love experimenting. My goal is to eventually develop a more recognizable style, but right now I am influenced by so many painters and am enthralled with representational work along with loose, painterly brushwork that could even bring in some abstract elements. This is a learning journey for me and I am looking forward to this new method of posting. Enjoy, and please write with comments or questions! 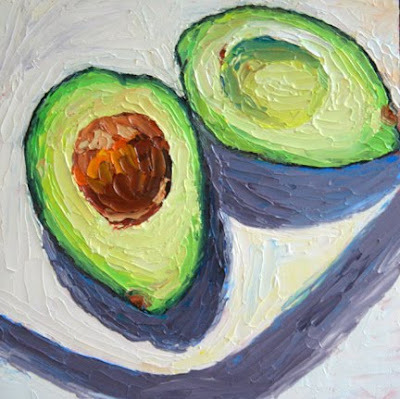 I will look forward to seeing more like this piece...that avocado looks sooo creamy! It will be interesting to see how your works develop. I think a lot of us would like to have a more recognizable style. But it seems so difficult to get there. I wonder if it requires lots of hard work. Also, one needs to have a general idea of what the goal is. It is so easy to deviate...as you say, by being influenced by other painters. As long as the journey has some enjoyment, then its worth it. I like the style in this painting. Lots of visible brush work and great composition. Good luck with the new blog!